There are many elements that go into creating an amazing wedding video, of course we have to have good lighting, cameras, audio and all the other technical things that you are hiring your videographer to worry about so that you can enjoy your day. In addition to the technical aspects of the video, which any good videographer can take care of, there are a few practical steps you can take to make sure your video is the best it can be. When you are choosing your location to get ready, be sure to allow enough space for your videographer and photographer to work. 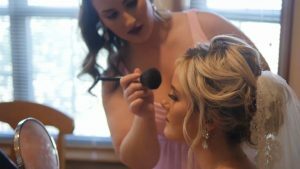 When your are getting ready in a small crowded room, it is very limiting creatively for your videographer and photographer. If you are getting ready in a hotel room, a separate hotel room just for the bride is great or a suite with multiple rooms is another option that works well. Both of these options provide a separate, quite and serene environment for you to get ready. As a videographer, in order to capture audio from special moments such as you opening a gift or reading a letter from your soon to be husband, we will need a reasonably quiet room to work in. It is also important that the room be well lit and natural light is always the best option, so look for a room with a large window that can fill the room with light. Many dedicated wedding venues have a bride’s room that allows plenty of room for everyone and are often well lit and designed for the exact purpose of wedding day preparations. By making sure that the creative professionals you have hired have plenty of space to work with, you are making sure that we can deliver our best work for you. 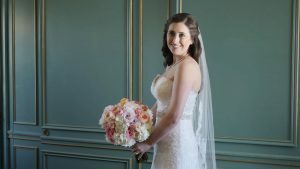 Creativity takes time and wedding days are full of many events that need to stay on schedule, so it is important to leave enough time for your creative vendors to be able to capture all the important moments. If your schedule is super tight and scheduled down to the minute, it doesn’t leave any flexibility to run out and get an amazing sunset shot or any other spontaneous creative idea that comes up. As a videographer, we price our services based on the number of hours we will be at your wedding. It may be tempting to go with a smaller number of hours to save some money, but keep in mind that by doing this you will miss out on getting some parts of the day on video. 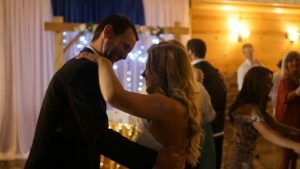 Most wedding venues and Churches are very accommodating for videographers and photographers and allow us to work with you and decide on camera locations and setup based on our experience and your preferences. However, some venues make capturing the ceremony very challenging with strict rules and policies in place for videographers and photographers. The policies can include restricting cameras to the balcony or a certain number of rows back or the officiant not being willing to wear a microphone for recording. Some venues also require proof of insurance or a signed agreement with each videographer before we can begin filming. Be sure to ask your venue about any rules they have in place and communicate those with your videographer and photographer in advance. Weddings are an extremely special time for you and your guests, and everyone will want a picture of the big moments. Luckily, almost everyone at your wedding will have their own camera on their phone and can take their own videos and photos all day. This is the amazing thing about the technology we all have today. However, all those guests with their phones out taking photos and videos are wonderful until they start appearing everywhere in your professional wedding video. We know that guests will be taking photos and video on their phones, but we do recommend that you ask them to refrain from doing so during the ceremony. This can be done with a simple announcement before the ceremony begins. This will eliminate distractions for your guests, make sure that your professionals are not blocked by a over zealous phone wielding family member or friend, and encourage everyone to be fully present during the ceremony. The reception is a great time for everyone to take as many photos or videos as they like. Creative reception lighting is a great way to set the atmosphere for your reception, your DJ or venue can probably offer all kinds of options to wash the room in whatever color you can imagine. This lighting will look amazing as your guests walk in to the room, however, for your videographer and photographer low light levels and lots of color against the walls creates some very challenging lighting conditions to work with. With all the colored light present it is very difficult or impossible to capture natural looking footage and everyone turns out looking blue or red or whatever color lighting you have chosen. To help your video footage look more natural, we recommend to have at least some overhead lighting or general normal colored lights on in the room instead of using only colored accent lighting. We do bring some of our own lights to supplement the light in certain areas, but we can’t light the entire room or overcome the colors washing from the accent lighting. The best solution is to tone down the colored lighting just a little, this will help make sure that your reception decor and more importantly, you and your guests, look great in the reception video.